The tundra biome is a harsh and fragile environment that spans across northern parts of Alaska, Canada, Greenland and Russia. 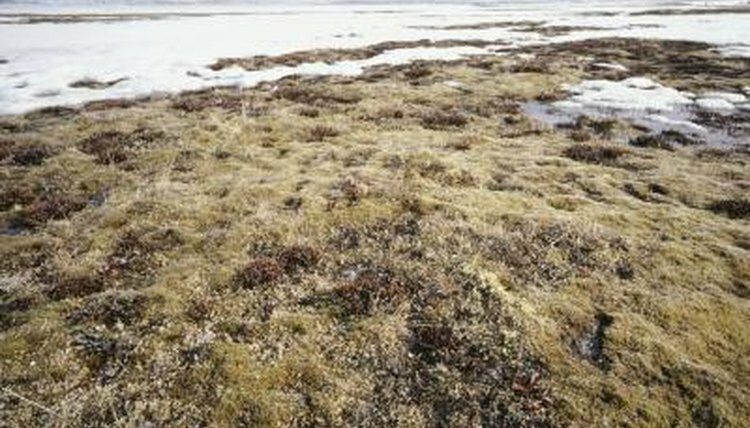 Depending on the latitude, tundra grounds are frozen permanently and only can support plant life such as small shrubs, grasses and plants. These plants provide a fitting environment for numerous species of animals, including moths. Moths of the tundra exhibit different adaptations and behaviors to survive. For example, some species are nocturnal, only coming out at night to search for food. Other species are diurnal, or active during the daytime. Arctic moths' wing colors are an important adaptation. Some moths have wing colors and patterns that resemble the vegetation they frequent. This camouflages them from predators. Dark wing colors help absorb heat from the sun to keep the moths warm. Arctic moths have a typical flight period in the summer months of June, July and August. Common habitats of tundra moths include woodlands, shrublands, fields, gardens, meadows, mountains and lawns. Their habitat preferences depend on their diet requirements, feeding habits and reproduction habits. For example, adult Jutta Arctic moths lay their eggs on grasslike plants, which develop into larvae on the grasses. The larvae feed until they develop into pupae, which remain dormant and attached to the grasses. The grasses provide the pupae with shelter from the cold and protection from predators until they develop into adults. The diet of adult tundra moths includes plant materials such as flower nectar and plant sap. As moth larvae develop, they feed on plants and grasses such as clover, chickweed, knotweed, asters, elms, sunflowers, birches and maple trees. Other larvae, such as the woolly bear caterpillar, are known to feed on other caterpillars if food sources are scarce. Predators to moths and moth larvae include birds, wasps and flies. Due to harsh environments, tundra moths adapted how they mate and where they lay their eggs. Some moths only mate once per year, while others are able to mate more than once per year. Eggs are laid on grasses and other vegetation. Depending on the species, some eggs will overwinter while other eggs hatch into larvae and begin to feed in preparation for overwintering as pupae.